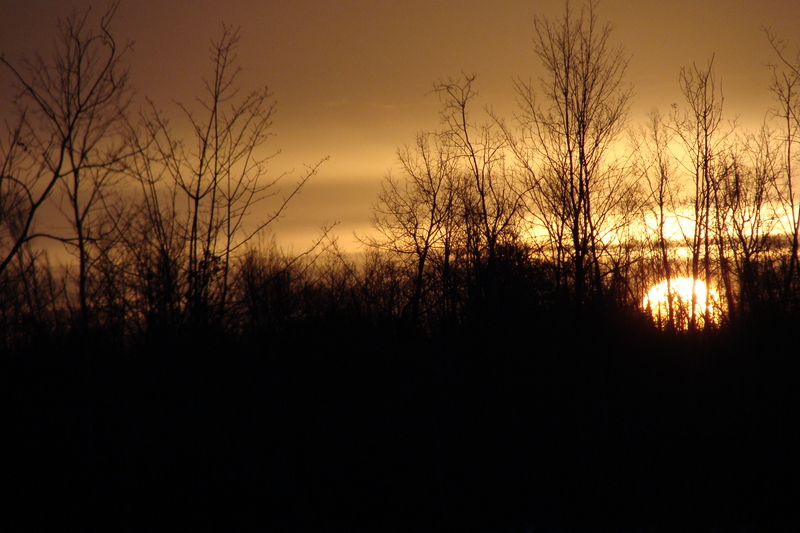 Sunrise over Polk County, WI, while in pursuit of hounders in state forest. The second day of the hound hunt for wolves found us patrolling the far eastern portion of Zone 3, where it borders the state of Minnesota. This is also the area where we witnessed a lot of wolf trapping activity when the wolf hunting season first opened on October 15th. After filling up with gas and coffee at the town of Danbury, where hound hunters are known to converge, we headed north into public forest lands in the far northern portion of Burnett County. Leaving Highway 35, we saw an atypical hounding truck driving along the St. Croix River. We turned around and started following the truck, thinking that the small Geo Tracker had been modified to accommodate two hounding dogs. First active hounders spotted on county forest land on the morning of 12/02. Hounds currently occupying boxes in back of vehicle, awaiting a fresh scent. We followed the truck as it turned off Markville Road and crossed the state line into Minnesota where hunting with hounds is illegal. We could see hounds in the back as they began to stop periodically to check for fresh wolf tracks. 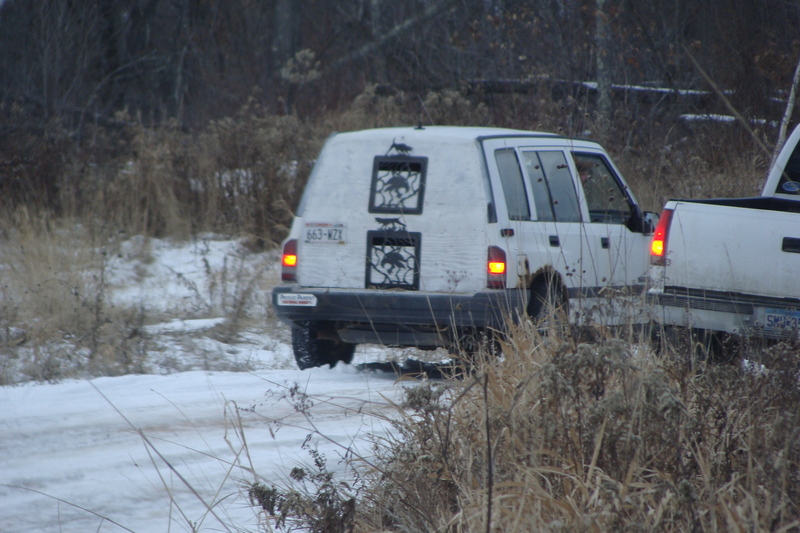 After approximately 30 minutes of hunting alone, the Geo Tracker met up with another truck with Minnesota license plates. While Minnesota’s wolf hunting season was also open, the use of hounds to hunt wolves is illegal in the state. 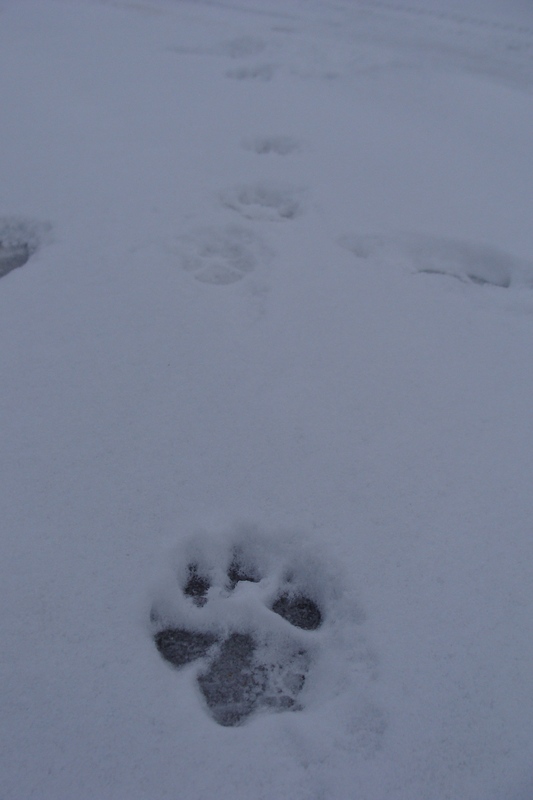 Fresh wolf track found on 12/02. After talking for ten minutes, the two vehicles parted, the one Minnesota truck passing us and giving us quite a look. We continued following the Geo Tracker as they continued to look for tracks, while hunting remained relatively uneventful. Over the next hour, the Geo Tracker re-connected with the Minnesota truck a number of times until eventually turning around and pulling up to our driver’s side window, wanting to talk. Both hunters asked how and what we were doing out there, and we told them we were driving around, enjoying the forest. They then interrupted to ask us directly if we were Wolf Patrol. We immediately answered yes, and both hunters looked at each other and chuckled. “Have you seen any wolves out here?” asked the driver. “I don’t know you tell me?” we responded. They then asked if we were having any luck finding wolf hunters and it was then our turn to chuckle. After wishing each other a good morning, the hunters drove off. 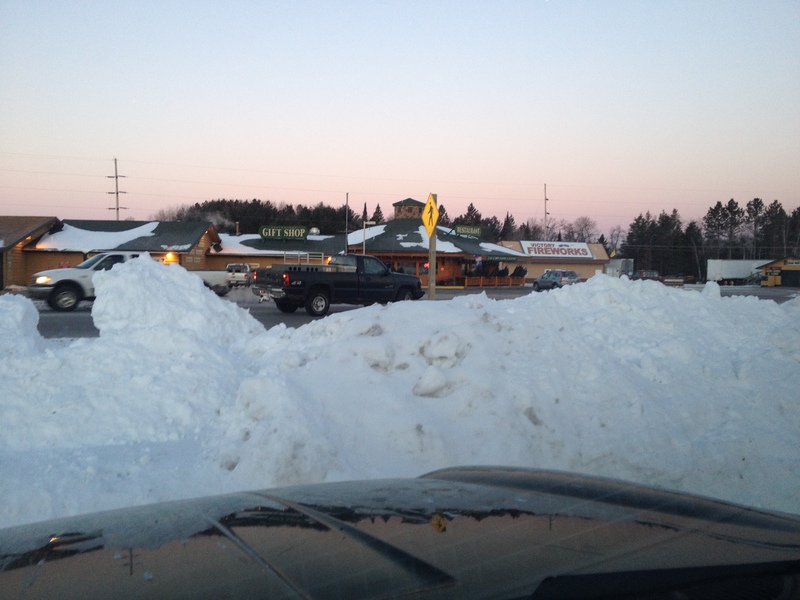 Shortly thereafter, we lost the hunters as they left Minnesota and re-entered Zone 3 in Wisconsin. 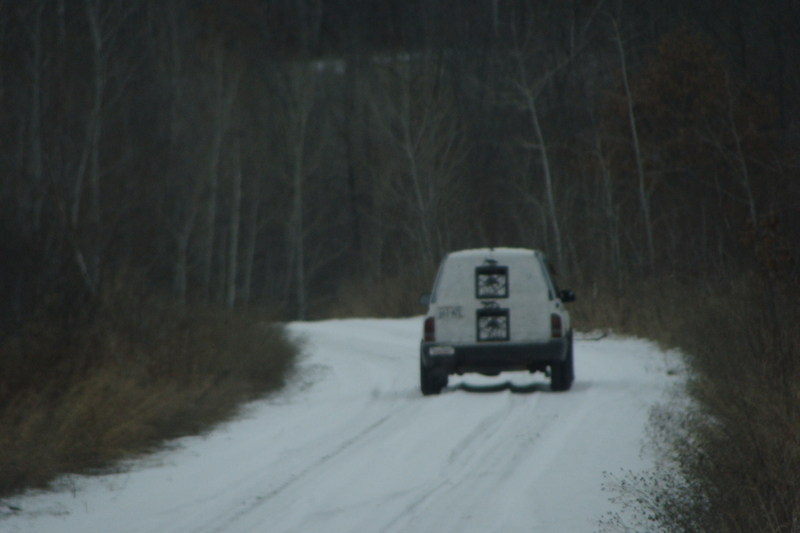 Hound truck seen rendezvousing with friendly vehicle in the Polk County forest at various points during our monitoring. Hounders previously monitored by Wolf Patrol brandish their trophy, collected south of Clear Lake, WI on 12/03. It is so sad,almost can’t even look at the photos of the ignorant men holding a lifeless wolf with such pride! What goes around comes around in life and the wolf and any animal killers will get what they so deserve in the end. Breaks my heart to see this happening today 😦 The poor helpless Wolves out there… Wake up you ignorant people who can actually kill such a majestic important part of all of our lives!!! I have filled in as many petitions as I’ve seen. I’m doing my best to inform as many people as possible that hunting wolves is just plain wrong. We almost lost all of our wolves in the United States and as long as I live I will do what I can to not let it get to that point again. I give you all the credit in the world.. It is so hard to deal with hunters, trappers & hounders in a civil manner. I found myself feeling sickened & angry seeing the photo of the poor, dead wolf. Their gloating over taking the life of the wolf leaves me no hope these people are capable of any empathy. I have to believe Karma will get the wolf killers in the end. Wow, I cannot get over the hatred they have for these beautiful animals, while they hug their dogs, a wolf relative!